Asthma is an obstructive disease of the airways characterised by reversible hyperactivity of the bronchi and trachea to a variety of stimuli. However all triggers produce the same response– constriction of the smooth muscles of the airway, inflammation and oedema off the bronchial mucosa, and increased production of bronchial mucus. This presents itself most frequently as coughing and wheezing in the absence of an infection. There is not a single known cause for asthma however there are many genetic and environmental factors which can contribute to the onset of asthma. Your environment or illnesses can cause asthma. It is known for your work to cause asthma which is known as occupational asthma. All cases of asthma have the fact that their airways have become sensitive to a variety of triggers. 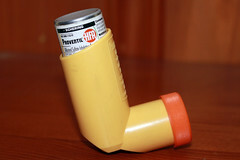 Asthma can be triggered by many factors, these include infections to the chest and airways, airborne irritants such as pollution, fumes and passive smoking, allergens such as pollen or animal fur, sudden changes in temperature usually caused by the weather or indoor elements such as mould and damp. Asthma can also be brought on by emotional factors including stress. This along with factors explained above make the work place a hazardous place for asthma sufferers. Stress and the working environment can induce an asthma attack. If your work has caused your asthma or brought on an attack you could claim for occupational asthma compensation. Although the onset of asthma may be at any age 80% of sufferers will have their symptoms before the age of 5 years old. Asthma is the most common cause for school absences and responsible for the majority of paediatric casualty and hospital admissions. A diagnosis is most commonly made on the basis of history of symptoms and a physical examination. Asthma can be an intermittent disease where a patient can be without symptoms for extended periods without medication. Some environments can increase the chances of asthma developing in adulthood such as work. If work causes or triggers asthma it is classed as work related or occupational asthma. Successful treatment is to have asthma symptoms under control using both preventive and relieve measures. Individuals will have a treatment plan taking into consideration the triggers for their asthma and will normally include daily use of inhaled corticosteroid together with reliever medicines to relax muscles and open constricted airways. In a case of a severe attack oral steroids or nebulised drugs can be used to regain control of this. Controlled breathing is also taught to patients as a treatment to be used along side the use of inhalers described above. Those with asthma are shown how to breathe through their nose using their stomach muscles. This has proven to reduce symptoms and reduce the sense of panic felt during an attack however cannot replace they need for inhaled drugs. Some have used complementary remedies although there is not enough clinical evidence for medical staff to recommend these. Those with asthma, especially children often exclude themselves from exercise in reluctance to provoke an attack. This can severely hamper peer interaction and hinder work responsibilities. It has been found that moderate or even strenuous exercise is adventitious to those with asthma. Participation in sports is encouraged, but this should be evaluated on an individual basis in terms of tolerance for duration and intensity of effort.